This card is for Janelle to send her a little love. Hopefully this will bring her some sunshine and smiles to her face. If you don't know Janelle and her story, you can find her blog HERE! Some lovely ladies organized a blog hop for her here so check out the other creations here. I was inspired by a card I saw and searched in vain to link up. I thought I had pinned it to my Pinterest board but apparently that is not the case ... It had coloured inks stamped on kraft and looked GORGEOUS!! Edited to add - just found the inspiration picture from the fabulous post on Paperella's blog. Thank you for your idea!! So I used that same idea and made my own card. I used my Fresh Inks to stamp the butterflies and Jenni Bowlin fountain pen ink (black) for the sentiment. The pigment inks look so beautiful on the textured kraft paper. I got the paper from an office supply store in the sale section and love it. It's not thick but the texture is really nice. Janelle, know that we are all thinking of you and sending you hugs. <3 I sent you a card last week that should get there soon, hopefully. Your butterfly card is just beautiful! Nice sale, paper too! Janelle will love this! This is gorgeous Cara! I love the butterfly in all of those colors fluttering about. What a beautiful butterfly card Cara~ I love all the different colors you used on this beauty!!! This is lovely, Cara! I love the colours you chose! Very pretty Cara!! I love the colors you chose! Just beautiful! I love the multicolored butterflies. What a pretty card!!! I love the butterflies and all the colors totally brighten up the day! 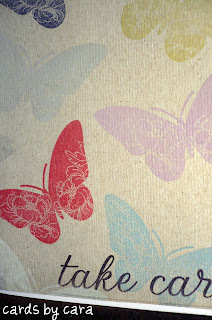 Love how you stamped the butterflies in all those lovely colors! Beautiful card for Janelle! Such a pretty card Cara. Thank you so much for joining us. Such a pretty card. I love those butterflies. 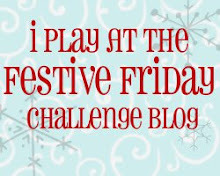 Thank you Cara, I am going to try my best to send a comment to Everybody participating in this Blog Hop. We appreciate the encouragement. So pretty! I love the soft colors! I am so glad you joined us Cara!